It was my birthday last week, and on that day, I was given the chance to guest-drive 750hp Driftmonkey Supra at Gatebil Rudskogen, the world’s most insane modified car event. Not bad eh? There’s lots more video to come, but for now, here’s my solo run in the “breisladd” (powerslide) competition. Even with one cylinder not firing, and some pretty wonky angle, I managed to place 20th overall. There were 84 cars invited to the qualifying, including the two other Driftmonkey drivers, team regular Anders Klerud who ended up ranking 5th, and the other guest driver Ken Gushi, who came 24th after mistaking the final outer clipping point as an inner clipping point. The placement of the clipping points also surprised me a bit, as I wasn’t expecting them to be a good two metres out from the ripple strip! I was just happy to make it fairly cleanly around the course (apparently my clips were all spot-on), but I probably didn’t make as much smoke as the car should have been able to. More pics and vids from Gatebil Rudskogen coming soon! My favourite tyre shop “4Heads” out in Saitama is staffed entirely by drifters who also work on their own cars after closing time. To follow-up on last week’s Touge Course video, here’s a couple of laps from North Course at Ebisu in the Skyline missile. After a long day drifting at Ebisu Circuit, it’s always fun to hit up the Touge Course to finish off the tyres! Enjoy these (almost) three non-stop helmet-cam laps. 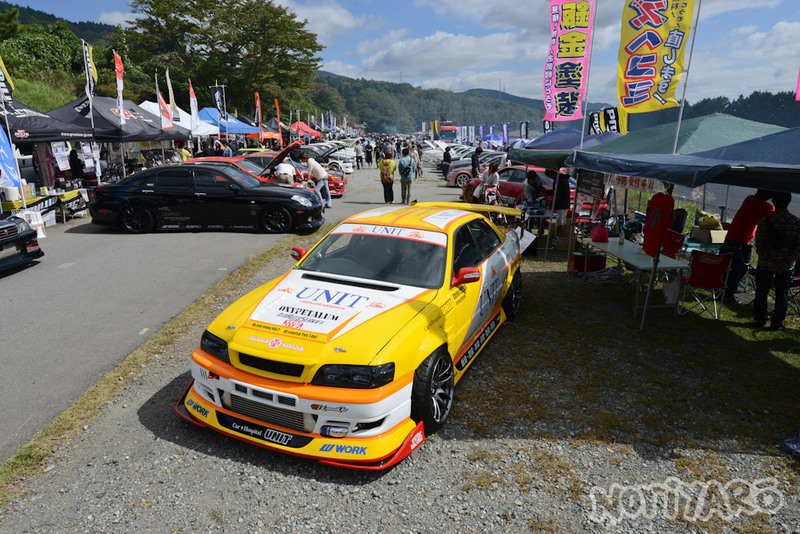 Here’s the final part of the 2013 1JZ Meeting coverage. This time, we’ll be looking at some of the action on the track, and also immediately to the side of the track in the dirt. These pics from last September might be a bit old, but they’re by no means stale. Let’s have a look at the 2013 1JZ Meeting at Fuji Speedway. I was up at Ebisu Circuit last weekend for another High Speed Drift Club event, and Team Orange’s Naoto Suenaga suggested we all have a three-lap race in the middle of the day with our drift cars. It was something he’d wanted to do for a while, so we gave it a shot. Here’s what ended up happening from my point of view. If you enjoyed last week’s AE86 drift video of Takuya Takahashi at Tsukuba Circuit, here’s a ten-minute, non-stop and uncut version of the new raw-video-only Noriyaro2 channel on Youtube.